Materials to replace copper at 5nm and beyond are starting to come into focus. For several years now, integrated circuit manufacturers have been investigating alternative barrier layer materials for copper interconnects. As interconnect dimensions shrink, the barrier accounts for an increasing fraction of the total line volume. As previously reported, both cobalt and ruthenium have drawn substantial interest because they can serve as both barrier and seed layers, minimizing the amount of high resistance material required. As linewidths shrink below 15 nm, though, even a 1 or 2 nanometer barrier layer may be too much. As line volume shrinks, the resistance of copper rises sharply due to electron scattering from sidewalls and grain boundaries. Increasing resistance adds to overall circuit delays and also contributes to electromigration. Below 15nm, the assumption that copper is the best available conductor may no longer be true. As Zsolt Tokei pointed out in a presentation at the recent IMEC Technology Forum, held in conjunction with Semicon West, ruthenium’s resistivity is relatively unaffected by line volume. In fact, for narrow lines ruthenium appears to have better resistivity than copper when copper’s need for a diffusion barrier is considered. Fig. 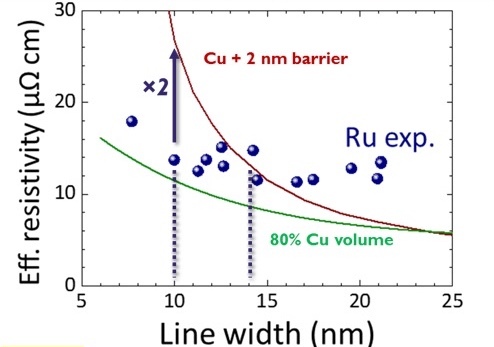 1: Effective resistivity as a function of linewidth for copper and ruthenium. Image courtesy of IMEC. Moreover, as a refractory metal, ruthenium has a very high melting point (above 2300 °C) and good electromigration resistance. Imec reports significant progress in integration of ruthenium into their sub-5nm node process flows. Deposition of cobalt, ruthenium, or any other material into sub-15nm features is extremely challenging, and has forced the industry to make extensive use of conformal deposition methods like ALD and CVD. Those deposition methods depend on the availability of precursor chemistries that can produce uniform, defect-free films. For example, according to Ryosuke Harada, Chemical R&D Section Chief at Tanaka Precious Metals’ Tsukuba Technical Center, whose company introduced a new family of ruthenium precursors at Semicon West, compounds that do not require reaction with oxygen are preferable, as they reduce the potential for ruthenium oxide contamination of the resulting film. At this point, both the transistor and interconnect processes for the 5nm node are just beginning to emerge. It does seem likely, though, that ruthenium will be part of the way forward as the industry confronts copper’s limitations. Advanced packaging is creating new stresses and contributing to reliability issues. Resistance and capacitance drive need for new materials and approaches. Next nodes are expected to be long-lasting, because costs of developing chip after that will skyrocket.